Round Counts Down? Golfers Losing Interest? The greatest invention in golf since the graphite shaft, the GolfBoard is forever changing the way golfers experience the game. Powered by an environmentally friendly lithium-ion battery, the GolfBoard is an easy-to-ride fully electric vehicle that adds a whole new level of fun and excitement. GolfBoarding changes the golfing experience, without changing the spirit and traditions of the game. With over 250 courses now offering GolfBoard rentals, and hundreds of thousands of GolfBoarding rounds played, the GolfBoard has a proven ability to attract new players and energize the sport. The GolfBoard dramatically increases the pace-of-play. After conducting extensive time trials—the average round on the GolfBoard is 2:37! Click Here to read the news from Today's Golfer about their comprehensive speed test comparison. They timed the same 4 golfers walking, using golf carts, and GolfBoarding. With each GolfBoarder going directly to their own ball at up to 10 MPH, it should be no surprise GolfBoard significantly speeds up the game. "Our winner in the New Age category is Golfboard, a combination of electronic snowboard and golf cart that allows you to traverse the course by maneuvering the device while standing on it, with your clubs right in front of you. Golfboard is fun, and it provides a bit of a workout for those feeling guilty about not walking." 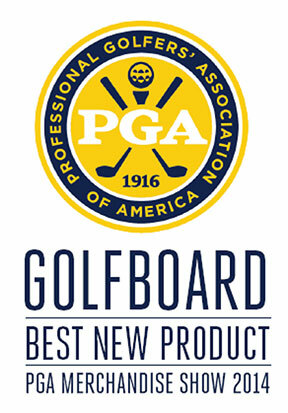 " If every golf course offered GolfBoards, golf would be the most popular sport in the world."